The original Calf Holes was on the left. 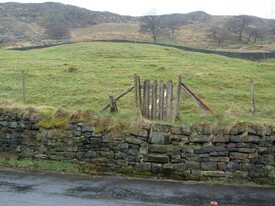 The original Calfholes was situated at the extreme end of Walsden near the border with the next township of Blatchinworth & Calderbrook. It stood close to Steanorbottom Farm on Calderbrook Lane. 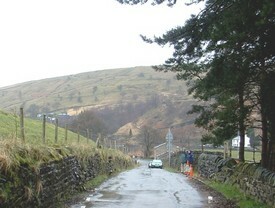 This old road had been the main route to Littleborough, Rochdale and beyond, but in 1825 it was replaced by a new turnpike road that by-passed the community of Calf Holes. On the corner of the new and old roads, a toll bar was built, designed so the keeper could see approachihg traffic from all directions. Calfholes was just a few yards away on the right of the photo. Nothing remains of this once thriving community. 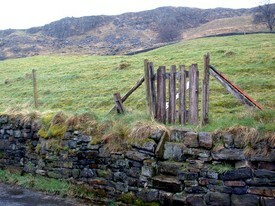 A few stone steps lead up from the lane to a rickety wooden gate, which leads to a field that rises upwards towards a menacing rock face. There are some signs of previous life in the field, stones scattered here and there, and a stone retaining wall near the top. Without this wall, the rocky outcrop above would be a serious danger should there be a fall. In 1758, Charles Hill and his wife lived in a cottage at Calf Holes. They were childless and he left this cottage, along with his dwellings and lands at neighbouring Reddishore, to his nephew, also Charles Hill. Charles Hill the nephew retained his ownership of the surrounding land and dwellings although he didn't live at Calf Holes himself. He died in 1808, leaving the cottage at Calf Holes in trust for his wife until her death, and then to be sold and the proceeds distributed between his several children. The cottage was leased out to Henry Rogers at the time Charles made his will in 1805. It was a busy community, with several families living there around the turn of the 18th century. There were Crossleys, Dawsons, Cryers, Deardens, Barons, Bentley and Hills, to name but a few. Henry Rogers was landlord of a beerhouse there, which may well have been the cottage owned by the Hill family. This was known as the Bird in Hand. When the new road was constructed, about 1825, the beerhouse lost its custom and was moved nearer to Walsden at Warland, where it stands today. Its story can be read from the link below. James Hill, whose relationship to Charles is unsure, farmed a small area of land at Calf Holes from 1806, taking over from Edmund Baron who died there in 1801. James continued at the farm until his death in 1837 aged 80. When the railway tunnel under the summit was being cut from 1838 to 1841, the houses were in danger of collapse due to the excavations for the tunnel. 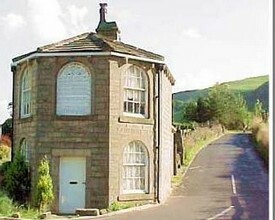 By way of compensation, the Railway Company built two good houses on the hillside near the Gale Inn towards Littleborough, possibly called Fair View. The new houses were made from the stone of the originals. By the 1841 census there were no inhabitants left at the original Calfholes. There were two unoccupied houses, which may well have survived the collapse. All the inhabitants had moved away. However, a new Calfholes appeared a mile or so further up the lane, still just about within Walsden. 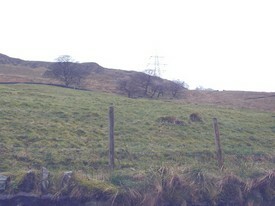 It was certainly the last set of dwellings in Walsden. There were three households living in the new place in 1841, including Susan Howard who ran a beerhouse. James Hill died at much the same time the original Calfholes was abandoned, but his daughter Ellen, now married to George Burgess, relocated to Fair View, where they are to be found in the 1841 census. However, by 1851 they had moved to the new Calfholes, where they were farming the land. George Burgess appears to have been the last farmer at Calfholes. The new Calfholes lasted until at least 1938 when it is shown on the OS map of that year. It is now deserted and a ruin.